For decades, demographers and workforce planners have been anticipating a transformation in the workforce, a trend that the team at RainmakerThinking calls The Great Generational Shift. For more than 20 years, Rainmaker Thinking has been tracking this process as it reshapes what it means to have a job and go to work. 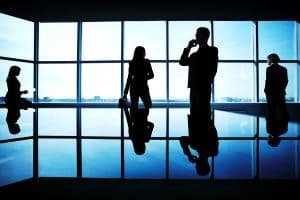 This is the final stage of a historic period of profound global change, and there is a corresponding transformation in the very fundamentals of the employer-employee relationship. The Great Generational Shift presents a whole new set of challenges for employers, employees, and managers at all levels. I began conducting in-depth interviews with young people, Generation X, in the workplace back in 1993, when I was myself a young person in the workplace. Since then, we’ve been tracking the ever-emerging, ever-“newer” new young workforce. By the late 1990s, we started tracking the “First Wave” of the great Millennial cohort, born 1978-1989, and by the early 2000s, we began tracking the “Second Wave”, born 1990-2000, when they first entered the workforce as teenagers in part-time jobs. Since then, we’ve kept our finger on the pulse of how these generational shifts are affecting the workforce as a whole, maintaining a comprehensive picture of where each generation is coming from and where they are going in the changing workplace. NOTE: Demographers differ about the exact parameters of each generation. The definitions are always somewhat in flux. Because both the Baby Boomers and the Millennials are such large generations, our model splits them both into “First Wave” and “Second Wave” cohorts. The long-dominant Boomers are on the wane, while the Second Wave Millennials are on the rise. The oldest of the First Wave Boomers are now in their 70s and every single day, in North America alone, another ten thousand First Wave Boomers turn 70. The trends (percentage-wise) are very similar throughout Europe and in Japan. By 2020, First Wave Boomers will be well under 6 percent of the workforce, and those who do remain in the workforce will continue trending heavily toward reinventing retirement and late-career-pre-retirement: working less than full time, often partially telecommuting, and often working non-exclusively for more than one employer. At the same time, and for the foreseeable future, the Second Wave Millennials (and soon post-Millennials) will be the fastest growing segment of the workforce. By 2020, those born 1990 and later will be greater than 28 percent of the workforce altogether (including post-Millennials). 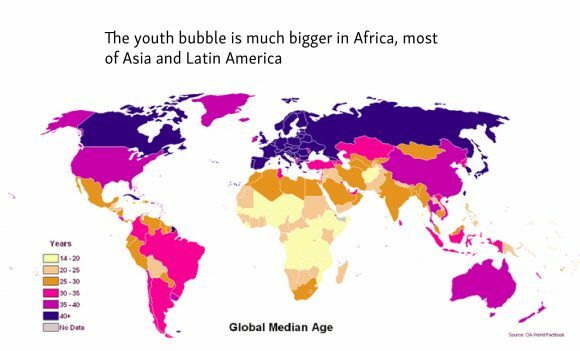 While the shift in numbers is swift and steady even in “older” North America, Europe, and Japan, the youth bubble is much, much larger in Africa, Latin America, and much of Asia. By 2020, in these “younger” parts of the world, those born 1990 and later will be more than 60 percent of the workforce. These numbers represent the essence of what we call the “numbers problem” for employers—as older workers leave the workforce, they take with them the skill, knowledge, wisdom, and institutional memory gained throughout their career. At the same time, organizations that rely disproportionately upon young workers will be facing challenges that require dedicating substantial resources to staffing strategy, attraction, selection, on-boarding, training, performance management, accountability, differential rewards, and retention. For more information about age bubbles and the numbers problem, check out The Numbers Problem – Workforce 2020 on YouTube. For more information about the Great Generational Shift, check out the 2018 Update to Rainmaker Thinking’s annual Great Generational Shift white paper.